Pairs app is a Classroom-only app which turns the terms and definitions (or images) into digital cards. This Study Set app is suitable to be used as ice-breaker where students will get to know one another through physical interaction. After the launch of the Pairs app, each student will be given a random one side of a card. Students are required to move about around the class to find their correct pair. For example, the first student ( Student Middle) gets a black color card with a word 'Jigsaw,' while the second student (Student Right) gets a card with an image of 'Jigsaw.' The students will need to find each other in the classroom and, one of the students may enter the corresponding card's key. In this case, the first student may enter the second student's key 'sr' or the second student may enter the first student's key 'sm' to activate the pair. 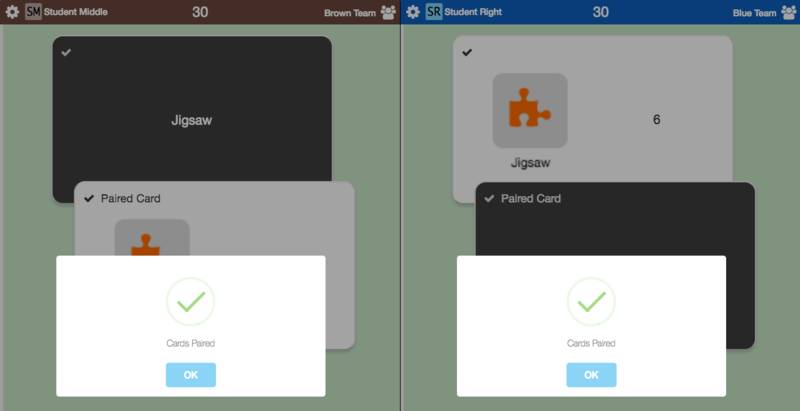 For every correct pair, a pop-up screen of 'Cards Paired' will appear on the screen of both students. If the number of students is more than the number of items in the Study Set, multiple correct matches may be present in the classroom. In the case where there is an odd number of students, the last odd card will appear on the Teacher's view. This extra card will enable every student to find a matching card in the classroom.